Pros love iMac. So Apple created one just for you. It’s packed with the most powerful graphics and processors ever in a Mac, along with the most advanced storage, memory and I/O — all behind a breathtaking Retina 5K display in a sleek all-in-one design. 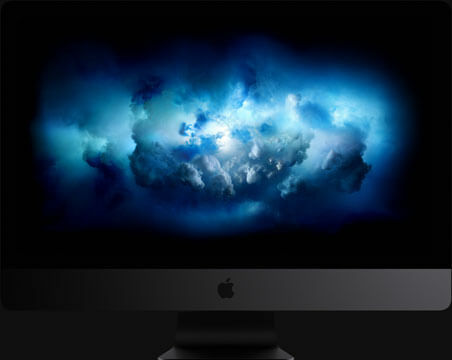 For everyone from video editors to 3D animators to musicians to software developers to scientists, iMac Pro is ready to turn your biggest ideas into your greatest work. Featuring Radeon Pro Vega graphics, iMac Pro delivers the best workstation-class graphics of any Mac. The first Mac with Vega architecture features up to 16GB of High Bandwidth Memory, which helps deliver a major jump in performance — two times faster than any other iMac GPU and three times faster than the GPU in Mac Pro. This translates to higher frame rates for VR, real-time 3D rendering, more lifelike special effects and gameplay at max settings. It also supports both single- and half-precision computing, so operations that don’t require a full 32 bits of precision can be performed twice as fast. How fast? Up to 22 teraflops fast. Introducing the Apple T2 chip — and an unprecedented level of security. The data on the SSD in your iMac Pro is encrypted with keys tied specifically to your computer, and secure boot ensures that only legitimate macOS software loads at startup. It almost goes without saying: if it’s an iMac, it will have a gorgeous display. And iMac Pro doesn’t disappoint. In fact, its 27-inch screen is our best ever, with 500 nits of brightness across its 14.7 million pixels. It’s as if the sleek, all‑in‑one design disappears behind the stunning screen — so you can focus on your content. Along with P3 colour and support for a billion colours, iMac Pro delivers spectacular, true-to-life images. Performance takes power, and power makes heat. So Apple completely redesigned the thermal architecture of iMac Pro with innovative dual blowers, a high-capacity heatsink and extra venting. The result? Almost 75 per cent more airflow and an 80 per cent increase in system thermal capacity. Which lets iMac Pro handle 500 watts — 67 per cent more power than the 27‑inch iMac. Available exclusively at the time of your iMac Pro purchase, these space grey accessories are wireless, rechargeable and beautiful. The Magic Keyboard includes a numeric keypad, and to go with it you can choose either the Magic Mouse 2 or the Magic Trackpad 2.